NWHikers.net - View topic - Wouldn't it be fun to be a weather forecaster? 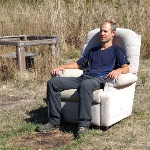 Forum Index > Trail Talk > Wouldn't it be fun to be a weather forecaster? established trend of prior solutions seems to be the safest bet. Ah, chaos. Stupid butterflies. A question I've had for a long time: why don't forecasts come with some indication of confidence? Is it that most people don't know what to do with a statement like "we are 60% sure there's a 40% chance of rain next Tuesday"? One could roll some dice and be about as accurate, at least for mountain forecasts more than a day or so out. They were calling for 1-2" of snow here and we got 7-8". Which is the value of reading the NWS Forecast Discussion. The forecaster that writes the discussion usually makes a statement about reliability at the point in time of the forecast, trends, and differences in various forecasting models. This looks to be about the most difficult situation for forecast models to resolve because it is so highly unusual, and looks even more difficult in a couple of days, and perhaps going forward, as there is essentially a battle royale between a modified arctic airmass that is driven by a very strange but persistent polar jet and an undercutting warm moist subtropical jet that appears that it will be undercutting the ridge to our west, and eventually portends a likely Pineapple express not far to our south. 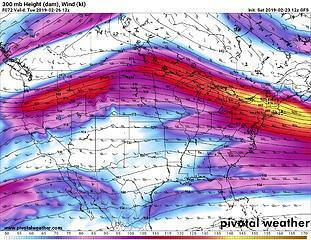 This shows the extremely strange Polar/Subtropical jet as forecast for Tuesday morning. What a bizarre loop in the Jetstream. The local situation of the exact position of low pressure systems off or near the coast and the temperature and depth of any modified Fraser outflow add to the confusion. It is right to say in this situation that the weather forecasts may only be valid day to day or even not at all. So what's the deal then? Its gonna snow sunday night?? Yeah, one can always find failures, despite the steady increase in forecasting skill since numerical modeling became a reality in the 50s, not to mention step functions in accuracy such as ensemble forecasting in the 90s. BTW it's usually a dart board in the analogy. The joke never gets old but of course it's wrong and in fact countless lives have been saved by weather services (when people actually listen). Thus gb's point that the uncertainty of the next few days does qualify as news in the man-bites-dog sense. I'm just hoping we don't get another big dump next week. Enough already! I don't know about Cougar Mountain, but my guess is all trails have snow coverage including Tiger and in valleys like Darrington and Baker Lake, and in the Eastern Olympics. Ashford still had something like a foot. With low elevation roads snowed in it is also not realistic to backcountry ski other than the main corridors and ski areas. We live on Squak and skied across early in the storm the snow is consolidated now and crusty. There is over a foot at Forest Rim @1200’. Tiger has at least a couple feet on WT3 we went up Section Line Thursday. Cougar has at least a foot at the Radar Peak Parking lot which has not been plowed nor the road. Today we have had rain, snow, gravel, and hail. Mabel a half nice stuck yesterday but has melted higher up the trees are snowy. As with a policeman's lot, a weather forecaster's lot is not a happy one. Especially here in the NW! Yes it would be great to have that kind of "flexibility" in job performance. Being able to say "its not my job" to be accurate would be great. My observation over the last 3-4 ski seasons is most of the major storms (with significant mountain snow accumulation) have been missed in the near term (2-3 days out) forecasts - but were forecasted correctly in the long term (4-6 days out) forecasts. It seems there is a reluctance for forecasters to believe near term weather models that go against the "it will be warm and never snow again" narrative. That reluctance hasn't really applied to the the long term models because those models are "accepted" to be more "speculative" - so when they contain a prediction that goes against the narrative no one cares. Out There, carrying the self-evident truth I am endowed by my Creator with unalienable rights of self-defended Life, Liberty, and the pursuit of Happiness. Good observations, Vertec. Forecasting snow in Seattle is a crap shoot because the conditions are usually so marginal. Fraser outflow, a system to the south, low level on, or offshore, and convergence zones all wreck havoc. Nearly every snow event in Seattle is a crapshoot and this is widely publicized. of frost and preheating the car each morning will likely continue. Back to the original question-yeah I think it would be fun to a weather forecaster and I appreciate a little levity in the forecast discussion. I would like to have the expertise to analyze the data they are assessing on a short term, long term basis as well as analyzing climate change. As for accuracy, I sometimes think people want the exact number of raindrops, snowflakes falling in a specific spot-I think in general accuracy is excellent for 3 to 7 days out if you take into account the Forecast Discussion and apply some common sense and a little local knowledge if happen to have it. Pretty tough right now to have anything in the way of a reliable forecast. Probably not very wet, but other than that, make a guess, win a prize. system may bring a chance of rain to the area Monday into Tuesday. the lowlands as they rotate around the offshore circulation. will be in the mid 30s to mid 40s. are sticking to their guns and are not converging on a solution.